Annual archaeological exhibitions were a visible symbol of archaeological research. Held mainly in London, the displays encapsulated a network of archaeologists, artists, architects and curators, and showcased the work of the first generations of trained archaeologists. The exhibition catalogues and published reviews of the displays provide a unique method for exploring the reception and sponsorship of archaeological work overseas and its promotion to a fascinated, well connected and well moneyed public. The exhibitions were a space in which conversation and networking were as important as educational enrichment. This paper analyses the social history of the “annual exhibition” in archaeology, highlighting the development and maintenance of the networks behind archaeological research, the geography of London as a way to examine influence in archaeology, and the utility of exhibitions for archaeological publicity during this period of exploration. Scholars have traced the history of the London Season from the 18th century when lengthy regular ‘seasons’ in both summer and winter around Parliament sessions saw the migration of aristocratic families from the country to the capital’s residences and special public or private buildings (e. g. Davidoff, 1986; Horn, 1992; Thompson, 1990: 16–17). Thompson notes that the Season was a time for artists, writers and musicians to find their aristocratic patrons; Knight observes that this patronage was also vital for scientists in the 18th and early 19th centuries (Knight, 2002: 218; Thompson, 1990: 16–17). By the late 19th century this institution was firmly established; Baedeker’s London and its Environs (1900: 1–2), informed visitors that, during the Season “chiefly comprised within the months of May, June and July”, they could expect that “the aristocracy are at their town houses, the greatest artists in the world are performing at the Opera, and the Picture exhibitions are open”. The London Season was not limited to the aristocracy, nor was it limited to parties, balls and entertainments. Public and private galleries and rooms across London displayed a large variety of art and archaeology.2 Two online database projects, Mapping Sculpture and Exhibition Culture, provide a wealth of information on the breadth of this ‘culture’ of display in 19th and 20th century Britain (University of Glasgow, 2006; University of Glasgow & HATII, 2011a). The annual archaeological exhibitions discussed in this article, although not explicitly included in these databases, nonetheless are part of the cultural landscape they reveal through their network of contributing artists, some of whom also exhibited their work in commercial art galleries (e. g. The Times, 1959). The appendix of annual archaeological exhibitions provided here (Appendix 2) serves as a complement to the information available through these projects. Research on private collectors and fine art exhibitions (e. g. Scott, 2003), the collections acquired by and exhibited at the British Museum (Jenkins, 1992; Moser, 2006; Wilson, 2002), Oxford’s Ashmolean Museum (e. g. Kurtz, 2000; Macgregor, 1998; Whiteley, 1998), Cambridge’s Fitzwilliam Museum and Museum of Classical Archaeology (e. g. Beard, 1993; Gill, 2000), and the creation of and displays within public civic museums in the 19th century (e. g. Hill, 2005; Riggs, 2010) provide a starting point for analysing exhibitions in archaeology. Annie Coombes’ (1994) work on the exhibition of material collected during the British expeditions into Africa and fundraising/promotional missionary exhibitions in Victorian and Edwardian eras yields another important parallel analysis of exhibition culture. Other authors (e. g. Greenhalgh, 1988; Hoffenberg, 2001; Parezo and Fowler, 2007; Stephen, 2009) have examined the large-scale international exhibitions and world’s fairs beginning with the Great Exhibition of 1851, which provided an overarching background to international and national cultural exchange, commodification and display during this period. Further studies expose more specifically the role of cultural spaces and events in presenting and representing Britain’s empire and in addressing anxieties over Britain’s international role (e. g. Ryan 1999; Smith 1999). However, the difference between these museum gallery displays and large-scale international exhibitions and the annual exhibitions discussed here is in the annual exhibitions’ regularity, their flexibility, their transient nature, their practicality as a tool for fundraising, marketing and promotion, their appeal to a London-based political, social, cultural and financial elite and their accessibility to the upwardly mobile middle classes and working classes (Thornton, 2011b). The annual archaeological exhibition provided visitors with ample opportunity to see recently excavated material publicly displayed, significantly, in London, a thriving cultural and imperial capital, before objects were divided and sent to museums and private collections scattered across the UK, Europe, America and beyond.3 This view of London as the setting for the archaeological exhibition season contributes a new angle to discourses on the city as a centre for the disparate, far-flung regions of empire (Driver and Gilbert, 1999). Significantly, though, the annual archaeological exhibitions mainly represented regions such as Egypt and Palestine that, although part of Britain’s imperial zone, sat somewhat uncomfortably within the concept of colonial empire (see Luckhurst, 2012: 124; Roberts, 2007). The objects, plans, photographs, paintings and drawings presented in these displays involved a network of artists, architects and excavators, most just beginning their professional careers. This network encompassed the clubs and strongholds of artistic London, with links to UCL’s Slade School of Fine Art, the Royal Academy and the Burlington Fine Arts Club. The exhibitions showcased developing techniques in photography alongside drawing and painting, and drew upon the example set in scientific and learned societies dotted around the city whose doors opened regularly during the Season for public presentations of research (see Knight, 2002; Thornton, in prep). Annual exhibitions served a variety of important functions for archaeologists. Not only were they opportunities to display a portion of the finds discovered during a season’s excavations, they were also a place where prospective archaeologists could enquire about or secure a position on the next season’s dig, and a temporary social space for the archaeological network in its widest sense. The roots of this socialised experience can be found in public scientific lectures, conversaziones and ‘clubland’ rather than in museums (see Alberti, 2003), subject of studies in the history of science (e. g. Kember et al, 2012) One of the most significant organisations for this social experience of display is the Burlington Fine Arts Club (BFAC). Originally established in the mid 19th century, it brought curators and collectors together, providing a social venue for assembling semi-public exhibitions from private collections around a specific theme. Although BFAC exhibitions were only open to members and designated guests, a parallel for the annual exhibitions discussed here can be found in its exhibition concept (BFAC, 1912: 10–22; Thornton, 2011b; Wilson, 2002: 157). Flinders Petrie and the Egypt Exploration Fund (EEF) originally premiered the annual archaeological exhibition in the mid 1880s. The format was adopted by a growing number of trained archaeologists still dependent on funding from ‘the public’ (rather than the state) for their work (see Thornton, 2013a). By the outbreak of the Second World War these exhibitions were a long-established event. This intellectual London season was prominently advertised in the press, with reviews and notices in The Times and the Illustrated London News among a range of other periodicals both specialist and popular.4 The analysis presented below demonstrates their importance to the continuation and growth of archaeological methods, the professional development of the individual archaeologists and groups supporting them, and their value in financial, cultural and political terms. In 1890 the Athenaeum described stepping from the hustle and bustle of Oxford Street into Flinders Petrie’s exhibition at Oxford Mansions of antiquities from Lahun in Egypt’s Fayum region as a “singular experience” (Athenaeum, 1890: 297). This observation highlights the annual exhibitions’ juxtaposition of ancient and modern: the ‘science’ of archaeological technique bringing forth the secrets of the ancients. Petrie first began exhibiting annually as an excavator for the Egypt Exploration Fund, an organisation collecting subscriptions for excavation in Egypt (Drower, 1985: 84). The EEF had been established in 1882, the same year in which Britain defeated the forces of Egyptian nationalist Colonel Arabi and began (unofficially yet publicly) to govern the country (Drower 1982; Mansfield, 1973). The excavation season lasted roughly from late November to May, mirroring the traditional “season” for Western tourism to Egypt (e. g. Baedeker, 1885: 2).5 From 1884, Petrie’s exhibitions were held in the months following his return to London - originally in late September but soon moved to July (see Appendix 2). The first exhibitions were held at the Royal Archaeological Institute’s offices in Oxford Mansions, a then newly built block of flats off of Oxford Street on the site of the 18th century Oxford Market (Appendix 2; Thornton, 2014a). It was the setting for six of the seven exhibitions Petrie arranged before becoming Edwards Professor of Egyptian Archaeology at University College London. Only one extant catalogue for these early exhibitions exists in the Egypt Exploration Society or the Petrie Museum archives. However, detailed reviews in The Times led readers through the exhibition space, directing them in great detail to objects of particular interest. For example, in an extensive 2.5 column review of Petrie’s 1890 exhibition of antiquities, readers were told the story of Lady Maket and how her body and possessions were found in a cellar in Lahun, the contents of which were featured on the central table in one of the Oxford Mansions rooms. Another room contained the rest of the Lahun objects, arranged chronologically. Audiences were instructed to go to this room first, after entering the space through a gallery of mummy cases (The Times, 1890). Such detailed descriptions allow us to visualise these early displays. Although Petrie left the EEF in 1886, he forged his own path with two new sponsor/patrons, businessmen Martyn Kennard and Jesse Haworth, and continued exhibiting his finds publicly.7 In a departure from his regular Oxford Mansions rooms, the objects from the 1887/1888 season at Hawara were put on display at the Egyptian Hall, 170–171 Piccadilly, a well known entertainment venue where magicians Messrs Maskelyne and Cook held regular shows during this period (see Baedeker, 1900 : 68; also Thornton, 2013b).8 The Hawara exhibition, the first with his new sponsors, included a series of Roman mummy portraits discovered during the season’s excavations, which The Times declared was “one of the most curious collections of Egyptian antiquities” ever assembled (The Times, 1888).9 Prominently featured in the Illustrated London News in June 1888, a full-page illustration of the Hawara exhibition featured a selection of objects and a partial view of the space showing wooden cases held open to reveal mummy cases within (ILN, 1888). The image conveys a sense of theatricality, and emphasises the ‘freshness’ of the antiquities peeking out of their cases. A shilling admission fee was charged in order to meet the expenses of these early exhibitions, which Petrie later noted could cost between £60 and £80 for rental space and a guard for the door (1931: 132). For the Royal Archaeological Institute it was a beneficial relationship – they charged a £20 fee for the use of the room, observing the increase in interest and visitors – specifically noted in reports as “the public” – that the exhibitions generated (RAI, 1885; 1886; 1887). By the 1890s the exhibitions were making their mark. The first extant catalogue is from Petrie’s 1892 exhibition, the final one at Oxford Mansions (Petrie, 1892). It is significant that the first mention of a catalogue in The Times appears in an 1892 review written prior to the exhibition’s opening, which suggests that the catalogue was pre-circulated to the press (The Times, 1892b). These initial exhibitions set the template for those to follow – displays became excavated sites reformed and curated in London, with objects, plans, photographs, excavators and even examples of local colour and context. Front cover of Petrie’s 1894 exhibition catalogue. Copyright Petrie Museum of Egyptian Archaeology, UCL. Being directed at a public audience, the exhibition catalogues Petrie produced for these UCL exhibitions served as his mouthpiece. Amongst the descriptions of objects and explanations of Egyptian history there are references to events occurring at the time the catalogues were compiled, revealing the exhibitions and the material produced for them to be unique and up-to-date. The 1894 exhibition catalogue, for example, provides the visitor with an outline of Petrie’s plans as Edwards Professor. 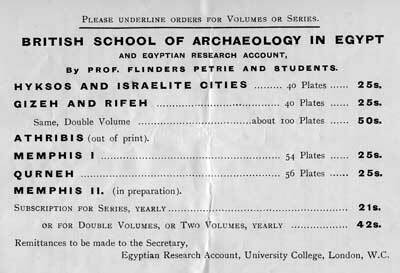 In it Petrie made plain his goal to begin the systematic training of archaeological students on excavations in Egypt through a newly created fund, the Egyptian Research Account, to which he hoped to attract public subscriptions (Petrie, 1894). The catalogues, and the exhibitions for which they were created, were thus a means to generate interest and support for Petrie’s plans (Thornton, 2011b). Petrie’s exhibition catalogues show the contributions of several of Petrie’s students and associates. Names appear throughout each catalogue, and using them Petrie’s evolving archaeological training network can be reconstructed (Thornton, 2011b). James Edward Quibell was the first recipient of Petrie’s Egyptian Research Account. Quibell was given due credit in the 1896 exhibition catalogue, and allocated the first room in the exhibition for the display of the finds from his excavations at the Ramesseum in Thebes. He arranged the room himself and described the objects he chose in the catalogue, while Petrie wrote the introductory section and the description of the second room, which contained displays of material from his own excavations (Petrie, 1896; Thornton, 2011b). When Petrie’s relationship with the Egypt Exploration Fund was restored in 1897, the exhibitions contained displays of both Research Account students and excavators working for the EEF, including Petrie. The objects were divided into two rooms, the organisation and interpretation of which was attributed separately in the catalogue. The physical space marked a differentiation between excavating parties. The catalogues began to reveal Petrie’s growing frustration with what he considered restrictive antiquities legislation on the part of the Egyptian government. This legislation had a real impact on antiquities exports, and consequently on the amount of excavated material Petrie was able to display in his exhibitions (Thornton, 2011b). Petrie’s wording here is significant. The exhibitions symbolised a ‘return’ on subscribers’ investments; the inability to provide could have a real financial impact on the continuation of work. The anxieties underpinning his statement reflect the precarious nature of archaeological funding in this period.11 The next year Petrie reported in the catalogue that shipping delays had affected the exhibition, which opened later than usual, and prevented results from the Egyptian Research Account excavation from being displayed. The delays forced Petrie to put together a loan exhibition of prehistoric vases from a private collection, advertised in the catalogue as “an opportunity of studying together a group which will soon be scattered to various collections” (Petrie, 1899: 4). On the other hand, Petrie’s disappointment over the number of objects he was able to bring back to England created an opportunity for some of the men and women working under his supervision. Drawings, plans and models they created were put on display replacing objects excavated by Petrie or the EEF but kept in Egypt (Thornton, 2011b). A Times reviewer noted that skilled reproductions of objects kept in Cairo helped visitors to appreciate the beauty of the absent artefacts (The Times, 1896). Male and female artists and copyists were integral to the interpretation of ancient Egypt in archaeological contexts. As Janssen shows, Petrie formed a group of “lady artists” (1992: 13); their work adorned the walls of the exhibition space and they were given due credit in the catalogues (Thornton, 2011b). Annie Pirie, who married J. E. Quibell after working with him in Egypt for several seasons, produced drawings displayed in the 1896 and 1897 exhibitions (Petrie, 1896; 1897).12 Many of these women were engaged in copying tomb paintings, and some of them had their work reproduced in the Saqqara publications. Royal Academy School-trained artists Florence Kate Kingsford and Winifred Hansard, and Slade School-trained artist Jessie Mothersole, contributed to the Saqqara drawings that were put on display in 1904 and 1905 (Anon., 1958; Blunt, 1964: 122; Petrie, 1904; 1905).13 Hilda Petrie and Howard Carter also produced drawings which were put on display in joint Petrie/EEF exhibitions, as did Norman de Garis Davies (e. g. Petrie, 1897; 1903; 1905). As might be expected, there was considerable overlap in artistic contributors to these exhibitions - some of the artists associated with the Petrie/EEF joint exhibitions also provided work for the EEF’s solo exhibitions. Howard Carter’s paintings from his work with the EEF at were displayed in an 1893 EEF exhibition in Manchester (EEF, 1893). Norman de Garis Davies and his wife Nina produced drawings for the Egypt Exploration Fund’s 1914 exhibition of antiquities from Antinoe and Abydos and Nina de Garis Davies supplied a praiseworthy copy of a fresco from King Akhenaten’s palace at Amarna in 1926 (EEF, 1914; The Times, 1926). These artists’ work enhanced the visual impact of the displays, giving the exhibitions an integrated message and adding another layer of interpretation to the artefacts on show. The exhibitions put together by Petrie and the EEF created a precedent for the display of archaeological materials. One of Petrie’s Egyptian Research Account students, John Garstang, joined Petrie’s excavations at Abydos in 1900. Although Garstang excavated under the Research Account for only two seasons, he gained experience in putting together London displays as the ERA excavator under Petrie’s supervision.14 Garstang arranged the Egyptian Research Account sections of Petrie’s 1900 and 1901 exhibitions (Petrie, 1900, 1901). His guidance to visitors in the catalogue was so explicit that it is possible to sketch a plan of exhibition space. Numbered tables or spaces containing groups of objects gave visitors a specific route through the exhibition. This is clearly demonstrated in this draft plan of the 1900 ERA room, created using Garstang’s numbering system and location references (Fig. 2). Before the opening of the 1901 exhibition Garstang wrote a lengthy letter to The Times advertising the work he did at the site – a not-so-subtle attempt to establish his name in a national setting (Garstang, 1901). Author’s plan of the Egyptian Research Account room of the 1900 exhibition at UCL using the catalogue as a source. Copyright Amara Thornton. Garstang helped set up the Institute of Archaeology at the University of Liverpool in 1904 (Gurney & Freeman, 2009; Thornton, 2011b). With the financial backing of “committees” of industrialists, philanthropists and museum curators, he began excavations in Egypt and Asia Minor, moving to the Anglo-Egyptian Sudan in 1909. Like Petrie and the EEF, Garstang held annual exhibitions each year to display objects from the season’s excavations, which were then distributed amongst his sponsors, including private individuals and UK, European and American museums (Thornton 2011b; 2013a). Garstang’s exhibitions were mainly held in London at the Society of Antiquaries, Burlington House (Appendix 2).15 His exhibitions were similar to Petrie’s in the use of art, photography and architectural plans to illuminate and enhance the excavated material on view. In 1909, when he began excavations at Meroe, an ancient city in Sudan, his exhibitions took on a new political significance and drew interest from high political and diplomatic quarters.16 These exhibitions, which ended after the outbreak of war in 1914, were the most important and visible of his career to that point – and the last he arranged in London. The London location was an important factor for these exhibitions, and will be discussed further below. Garstang also had assistants on excavations who contributed to staffing and augmenting the exhibitions. One of Garstang’s early assistants was the artist Harold Jones, a student at the Royal College of Art. Layla Pinch-Brock’s brief biography of Jones indicates that, while Garstang depended sometimes too heavily on Jones’ administrative skills, Jones obtained valuable connections through Garstang’s network before his early death from tuberculosis in 1911 (Pinch-Brock, 2007). Jones’ correspondence reveals that he created copies of his watercolours from the excavations for the exhibition and for some of Garstang’s most elite supporters, including Princess Beatrice - Queen Victoria’s youngest daughter (Jones 1904a, 1904b; Thornton, 2011b). Jones also provided a reproduction of a panel for the Egypt Exploration Fund’s 1907 exhibition, highlighting again the overlapping artistic network between various archaeological excavation teams (EEF, 1907). The annual exhibition season had a slow start after the trauma of the First World War. Having stopped displaying in 1914/1915, both Petrie and the Egypt Exploration Society (as the EEF renamed itself in 1918) did not begin regular exhibitions until 1921 (see Appendix 2). After the war Garstang moved from Sudan to Palestine, becoming the Director of Antiquities for the newly established British Mandate government and Director of the British School of Archaeology in Jerusalem, founded in 1919 (Gibson, 1999; Thornton, 2011b). He spent much of his time each year in Jerusalem and the surrounding region. His annual exhibitions appear not to have continued during the post-war period, possibly because he spent so much time overseas. Petrie moved to Palestine in 1926 citing unfavourable conditions for continued excavations in Egypt (Petrie, 1926). In this period he diversified his strategies for fundraising alongside the exhibitions, including commissioning the production of sets of camerascope images showing 3D scenes of excavation life (see Sparks 2013). He stopped exhibiting his finds after 1934. In letters to The Times he attributed the discontinuation of his annual exhibitions to the Mandate Palestine government’s restrictive antiquities policy, preventing the removal of objects discovered (Lyons, 1926; Petrie, 1934a, b). As ‘exhibition season’ re-emerged in earnest, it reflected Britain’s new role in a shifting post-war imperial landscape having gained a controlling interest in former Ottoman Empire territories in the Middle East. This shift increased the visibility of British archaeological research in these regions, which was paralleled in London in the exhibitions that resulted from the work. This increasingly diverse exhibition season featured young professional excavators striving to make their mark. Leonard Woolley, Reginald Campbell Thompson, Max Mallowan and Guy Brunton, whose excavations were funded by or connected to the British Museum, began arranging temporary exhibitions there to promote and fundraise for their work (Appendix 2; also Bowring, 2012: 9–12). Alongside Egypt, these exhibitions brought attention to newly (re)organised regions, as British archaeology flourished in post-war British mandated territories – Iraq (Ur, Nineveh, Arpachiya), Palestine (Tell Duweir, Mount Carmel, Samaria) and Transjordan (Jerash). 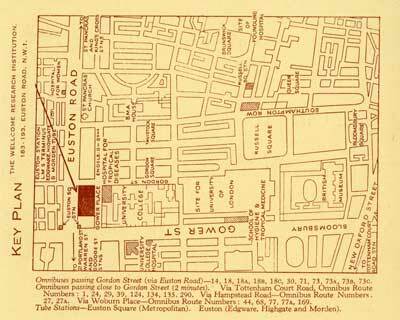 The reverse side of an invitation to a Wellcome-Marston exhibition of antiquities from Tell-Duweir (Lachish) in the late 1930s, giving visitors a map to the new Wellcome Research Institution on Euston Road. Local omnibus routes and Underground stations are also listed. Copyright Palestine Exploration Fund. The EEF moved in 1913 from King’s College London to the Society of Antiquaries, where they had held some exhibitions during their first split with Petrie, and overlapped for two seasons with Garstang’s Meroe exhibitions. After the war, the EES continued having exhibitions at the Society of Antiquaries. By 1931 the EES moved to the Wellcome Historical Medical Museum at 54a Wigmore Street for two seasons, and for one season to the Architectural Association at 36 Bedford Square, eventually settling in the Palestine Exploration Fund headquarters at 2 Hinde Street (Appendix 2). In the post war era, archaeologists attempted to meet developments in technology and design head on. These later exhibitions occasionally incorporated the technology of motion pictures – films of EES and Wellcome/Marston excavations were screened to complement the displays (Fig. 4) (e. g. Naunton, 2010; The Times, 1931). Efforts were made to publicise the 1931 EES exhibition in the London Underground (EES, 1931; Thornton, 2012). The Society’s excavations at Armant and Abydos brought an updated look to the exhibition catalogues; the ones produced between 1933 and 1937 are sharply designed with a bold modern font and logo (Fig. 5). 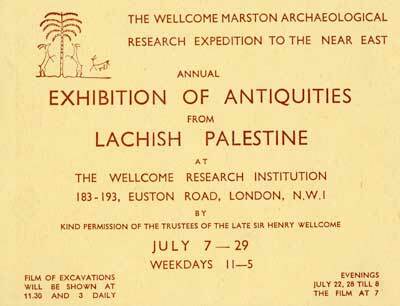 An invitation to the exhibition of antiquities from Lachish, from either the 1937 or 1938 season. It includes details of film show times complementing the display. Copyright Palestine Exploration Fund. 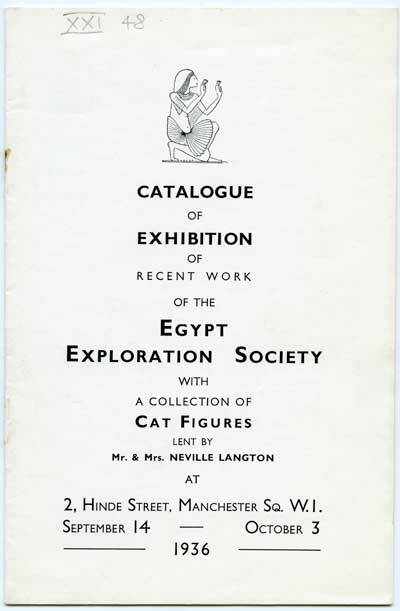 Front cover of the Egypt Exploration Society’s 1936 exhibition catalogue, with modern font and stylised logo. Copyright Egypt Exploration Society. Scholarship on museums, exhibitions and other public displays demonstrates their popularity in the social and cultural life of the city. Moser (2006) discusses the British Museum’s Egyptian displays within the context of late 18th and early 19th century London, using guidebooks and memoirs to highlight the visitor experience. Altick’s work on public entertainments and culture (1978) reveals that London’s populace in the early Victorian period would have been familiar with socialised visual and educational spectaculars. Hill (2005: 134–135) shows the benefits of comparing visitors’ experience of museum galleries to music halls in the provinces. Hoffenberg’s work reveals that after the 1851 Great Exhibition, evolving sophistication in exhibiting empire meant that audiences, particularly in London, would have been attuned to developments in displays of ‘foreign material’ (2001: 8). Horrall (2001) further examines the impact of increasing leisure time and disposable income on the appreciation of cultural experiences in London in the late 19th and early 20th centuries. Although far more intimate and exclusive than the grand international colonial/imperial exhibitions and popular entertainments, the regularity of annual archaeological exhibitions contributed to the sustained visibility of foreign cultures and histories in London. The notion of exhibitions as a particular feature of the Season was observed in the late 19th century - in his essay “The Picture Season in London”, American author and critic Henry James described the English as “as largely addicted to intellectual luxury as to material”, while during the Season London’s “streets … bedizened with motley placards and the names of all the great singers, and players, and actors, and painters, confront you at every turn” (1878: 150, 151). The roster of annual archaeological exhibitions in this article demonstrates that London was also a centre for publicising and displaying archaeology. By 1900, London’s population had swelled to over 4.5 million people – the next largest city in Britain, Glasgow, had 724,349 residents, while New York, the United States’ industrial and cultural capital and the second-largest Western city, had a population of nearly 3.5 million (Whitaker 1899 : 409). London was dubbed “the scientific centre of the British Empire” at the turn of the 20th century (Munro, 1902: 272). Its West End was a fast changing area of urban redevelopment, and has attracted attention from cultural historians as a centre of bohemianism, cosmopolitanism and commerce of goods, ideas and people from around the world (e. g. Brooker, 2004; Walkowitz, 2012). In the West End in particular “Scientific London” clustered (see Munro, 1902: 272). Stephen Shapin’s work on the geography of knowledge and Pamela Jane Smith’s work on the Cambridge tea room both highlight the importance of geographical location and space for the creation, development and promotion of knowledge – the ‘geography of knowledge’ (Shapin, 1998; Smith, 2009). In the same vein, the locations of the annual exhibitions became an important tool for archaeologists. As such, they reveal a ‘geography of influence’. Petrie noted that the 1888 Hawara exhibition at Egyptian Hall (secured with the backing of his patron Henry Martyn Kennard) yielded valuable contacts for him with the arts establishment, including Pre-Raphaelite painter William Holman Hunt, and Royal Academician William Blake Richmond (1931: 89–90). When he eventually moved the exhibitions to UCL, Janssen notes that they made UCL one of the epicentres for engaging with archaeology, whether as a visitor or as a student (1992: 8). Petrie’s exhibitions dominated the Bloomsbury area. Ashton demonstrates that by this period Bloomsbury was a well-established hub for intellectuals, writers, artists and educational institutions (2012: 1–24). It was noted at the turn of the 20th century as a city within a city full of “cheap boarding houses” and teeming with German and American tourists (Cook, 1902: 247). After Petrie and the EEF formally split for the second and last time in 1905 (Drower 1985: 296), the EEF initiated its own series of exhibitions at UCL’s great rival, King’s College London, on the Strand, the following year.22 This geographical relocation set the EEF apart both physically and metaphorically, establishing an identity separate from Petrie’s now-solo status. Comparing the dates of these exhibitions (Appendix 2) demonstrates that, for the most part, they were running at exactly the same time of the Season, namely July, falling within the dates of the Royal Academy’s annual summer exhibition and the Royal Institution’s summer lecture series.23 Contemporary maps, guidebooks and street directories yield valuable contextual information about the locations of these exhibitions. Garstang exhibited at Burlington House for several seasons - it was his London base. Garstang’s exhibition “guides”, listing his sponsors and the names of the notable figures who opened his exhibitions, echo the cream of a ‘Society’, the ‘upper ten thousand’, that was by the late 19th century an amalgamation of aristocratic families and emerging business/financial leaders (see Davidoff 1986: 59–61; Evans & Evans 1976: 7–8; Garstang & Sayce, 1910; Garstang, 1911, 1912; Garstang & George, 1913; Garstang & Phythian-Adams, 1914; Horn 1992: 5; Thornton 2011b, 2013a). By 1914 Garstang counted amongst his sponsors industrialists Sir William Hesketh Lever of Sunlight Soap, Sir John Brunner and Robert Mond of Brunner, Mond, a chemical manufacturing firm, and pharmaceutical magnate Henry Wellcome of Burroughs Wellcome, who was then financing and conducting his own excavations in Sudan at Jebel Moya (Garstang & Phythian Adams, 1914; Thornton 2011b, 2013a). The exhibition opening ceremonies included an even more well connected group – Garstang’s Burlington House exhibitions were “inaugurated” by members of the aristocracy and royal family, including the 6th Duke of Portland, Princess Beatrice, the Duchess of Connaught; the Countess of Derby (Liverpool Institute of Archaeology President); Viscount Herbert Horatio Kitchener of Khartoum; the Lord Bishop of London; and Director of the British Museum Sir Frederic Gerard Kenyon (Garstang & Phythian Adams, 1914). The Times’ Court Circulars, listing the movements of the royalty, nobility and others of note, reveal the elite (non-scholarly) audiences who came to view the exhibitions after the opening ceremonies. Evans & Evans (1976: 25–26, 52) note that gallery visiting was a regular feature of ‘Society’ calendars, occurring mainly before lunch. In 1911, 1912 and 1914, notices appeared recounting such visitors to Garstang’s Burlington House exhibitions. These included the philanthropist and socialite Lady Llangattock (Georgiana Rolls), the collector and Garstang supporter Lady William Cecil (Mary Tyssen-Amherst) and Prince John George of Saxony in 1911; Chairman of the National Arts Collection Fund Lord Balcarres, the Duke of Argyll (married to Queen Victoria’s daughter Princess Louise), the Sirdar and Governor General of Sudan Sir Francis Reginald Wingate in 1912; and Queen Victoria, Princess Mary and Kitchener in 1914 (The Times, 1911c, 1912, 1914). As Governor-General of Sudan, Reginald Wingate was well aware of the potential publicity that Garstang’s exhibitions could generate for archaeological research; the British-controlled government in Sudan was eager to harness this publicity to attract research and funding to the country (Thornton, 2011b). Even far beyond London, exhibitions were a powerful symbol. The 1912 Annual report of Gordon College Khartoum, submitted by Wingate to Kitchener, then British Consul-General in Cairo, stated plainly that Garstang’s London exhibition had served to publicise widely the possibilities in Sudan for archaeological exploration (Wingate, 1912). Kitchener supported Garstang’s exhibitions, writing a letter to The Times in 1911 before opening that year’s exhibition expressing his wish that the educated British public would appreciate Garstang’s plans to conserve the site (The Times, 1911a, b). He hoped this public would respond by financing Garstang’s work, and in doing so increase Britain’s ability to discover and conserve Sudan’s past (The Times, 1911a).26 Kitchener’s vocal and personal public backing for the exhibitions’ role in drawing attention to Sudan’s archaeological potential, underpinned by Wingate’s endorsement of their value, indicates that the political elite responded to Garstang’s public presentation of Sudan in London, placing Sudan’s heritage in an economic and political as well as a cultural framework. The legacy of Garstang’s Burlington House exhibitions remained strong in the memories of those interested in the Sudan after the First World War. The Sudan in Evolution (1921), a record of the British administration in Sudan, included sections on the attractions of archaeology in the country. Its author Percy Martin recounted Garstang’s final exhibition of Meroe objects in 1914, noted its innovative approach to illuminating the varieties of “Ethiopian culture” and credited the exhibition as the meeting point between the Excavation Committee and the interested public (Martin, 1921: 249). Both prospective and established archaeologists used the social nature of the exhibitions to meet and network with others in the field. Prospective archaeologist Agnes Conway’s diary provides an illuminating example of the nature of the ‘intellectual’ London season. In it she recorded the details of her social schedule, in which visits to annual archaeological exhibitions sat alongside other social-cultural experiences. In 1911 she hoped to join Petrie’s excavation team, taking the opportunity to speak to the Petries at their exhibition (Conway, 1911).27 Two years later she visited Petrie’s exhibition of objects from Tarkhan after seeing an exhibition of Leon Bakst’s Ballet Russes costume designs at the Fine Arts Society (Conway, 1913). In 1914, she visited Petrie’s exhibition of Lahun jewellery on 10 July, and the following week attended “the Burlington Fine Arts Club + the two Society of Antiquaries Egyptian Exhibitions, and talked the whole afternoon at the Club” (Conway, 1914a, b).28 She was still attending exhibitions in the late 1920s, visiting Leonard Woolley’s exhibition of objects from Ur at the British Museum and Petrie’s exhibition of objects from Beth-Pelet (Tell Fara) in Palestine on the same day, noting that Hilda Petrie was “worried to death about money” (Conway, 1929). Similarly, an anonymous undated draft of a biography of the archaeologist Gerald Lankester Harding (by the mid-1930s a member of the Wellcome Marston Expedition), describes the young Harding reading a notice of the EES Egyptian Exhibition at the Society of Antiquaries in a newspaper while at barber’s shop on Piccadilly in 1924. On attending the exhibition that evening he met (unbeknownst to him), the archaeologist Francis Llewellyn Griffith, who recommended that Harding visit Petrie’s exhibition of antiquities. It was the beginning of Harding’s career in archaeology (Anon., n. d.). Extant catalogue collections also demonstrate the archaeological social network these exhibitions facilitated. The Petrie Museum’s copy of the 1909 BSAE catalogue belonged to Lina Eckenstein. Eckenstein, one of Petrie’s “lady artists” involved in the early years of the BSAE, clearly visited the exhibitions even after her role in the excavation team itself had lapsed.29 The exhibitions were certainly a way for the network to meet. John Crowfoot, an archaeologist and an official in the Egyptian Education Department, wrote to Garstang in 1911 that “I am looking forward to seeing the Exhibition this summer, the bronze head in particularly [sic] to whomever it is ultimately to belong. It was a great regret to me that I was unable to see your [illegible] finds as I did not go on leave last year” (Crowfoot, 1911). Crowfoot’s letter demonstrates again the popularity of these annual exhibitions within scholarly and administrative circles, and the return visitor network that each year’s displays generated.30 Similarly, Professor Valdemar Schmidt an Egyptologist, Egypt Exploration Society member and curator at Copenhagen’s Glyptothek Museum, a friend of Petrie’s and a sponsor of Garstang’s, was noted in his Times obituary for regularly visiting Petrie’s exhibitions (see Anon., 1925; Bagh & Nielsen, 2011: 7–23; Del Vesco, 2013; Garstang & Sayce, 1910). As discussed above, excavation team-members themselves also became part of the social network of the exhibitions. Janssen (1992) and Drower (1985) both note the work of Petrie’s students in putting together the exhibitions. Excavation team-members could also act as tour-guides. Harold Jones and another of Garstang’s students, the Hon. R. H. Trefusis, were available to conduct visitors around Garstang’s 1907 exhibition at the Society of Antiquaries (The Times, 1907). The year before, a review of Petrie’s exhibition of objects from Hyksos Camp in The Times explicitly noted provision for guided tours of the displays twice daily for the duration of the exhibition (The Times, 1906). This continued after the war – the Palestine Exploration Fund Quarterly Statement noted that Hilda Petrie would be on hand at the 1928 Tell Fara exhibition between 11 and 1 pm every day (PEF, 1928: 113). The final part of this analysis of the annual archaeological exhibition season is its potential for marketing archaeology to an audience with the time and money to satisfy their interest in archaeological work. Excavations were precariously financed, reliant on a base of individual and organisational subscription and private support that had to be renewed annually (Sparks, 2013; Thornton, 2011b, 2013a). Once Petrie established the British School of Archaeology in Egypt in 1905, he began a marketing campaign through the exhibition catalogues, which he used to advertise his own publications and those of his students. The catalogues also included a removable subscription page, to facilitate those visitors who wished to subscribe to the School and (implicitly) to the training of professional British archaeologists who would be able to continue the work begun by Petrie in scientific excavation techniques (Fig. 6). Subscription page from Petrie’s 1909 catalogue. Copyright Petrie Museum of Egyptian Archaeology, UCL. Visitors could give money to the exhibition attendant, on hand to receive it (e. g. Petrie, 1900). Subscribers were urged in the catalogue to give the subscription form to friends to extend the funding network further (e. g. BSAE, 1911). The EES also incorporated a removable subscription page into their exhibition catalogues, but were not as consistent with this particular tactic in their catalogues as Petrie. Analysing the opening hours and admission prices of the exhibitions demonstrates that the first exhibitions had limited opening hours and were more exclusive – visitors were required to present cards for admission (Appendix 2).31 Barring the 1888 Hawara exhibition at Egyptian Hall, these initial exhibitions also took place in the autumn, after the end of the Season, but were moved to July when Petrie moved to UCL in 1894. This shift could suggest that, having seen a glimpse of the potential of the July date in 1888, once he gained a position at UCL Petrie used the power of the Season to establish himself firmly in the public eye, with other excavators following suit. As the exhibitions became a more regular feature of the Season, displays were open daily. Petrie noted in his memoir that by 1901 “a new public feeling” had been generated by his work at Abydos, and “some workmen would spend their whole dinner hour” at the exhibition (Petrie, 1931: 179; see also Drower 1985: 263). After 1906, Petrie’s exhibitions featured extended openings in the evening, which a reviewer noted were specifically targeted towards those who worked during the day (The Times, 1906). Exhibitions at the Society of Antiquaries can be considered more exclusive events, catering more to the middle and upper classes than providing for the enrichment of the masses. However, accessibility was still desirable, and expected, even from elite audiences. After being unable to see another display at the Society because the Antiquaries’ Hall Porter had closed the building early, a disgruntled Savile Club member wrote to The Times in 1904 querying whether Garstang’s exhibition of antiquities from Beni Hasan would be open after 4 pm. The Beni Hasan Excavation Committee responded in print, stating that their display was open until 5.30 (The Times, 1904a, b). Assessing visitor numbers for these exhibitions is a challenge. As available records indicate that they were mainly free to enter, admission fees cannot be used as an indicator (see Appendix 2). Published comments on attendance are often frustratingly vague – for example, the Egypt Exploration Society recorded in 1929 that their exhibition of antiquities from Armant and Amarna at Swedenborg Hall was “fairly well attended” (EES, 1929: 272).32 However, occasionally more precise figures are available. Petrie recorded toward the end of 1888 Hawara exhibition’s run that he expected visitor figures to reach 2,000 (Petrie referenced in Challis, 2013: 113), while Janssen also notes a figure of circa 2,000 visitors to Petrie’s exhibitions (1992: 8). The exhibition catalogues, priced at sixpence, were on par with those produced for other cultural events – music hall show programmes, for example, also cost sixpence (see Baedeker, 1900 : 67). Recent work on Petrie’s day diaries shows that he occasionally recorded the number of catalogues sold at the exhibitions (Del Vesco, 2013: 86–87). In addition to showing how much money could be raised through such sales, these figures also give some idea of visitor numbers. During his successful 1914 exhibition, Petrie noted that 295 catalogues were sold over two days (Del Vesco, 2013: 87). In this case, given free entry the number of catalogues sold is most likely only a partial reflection of actual attendance. In researching these exhibitions, ‘seasonality’ becomes an important consideration on both a practical and analytical level. Practically, knowing the seasons of excavation and exhibition helps complementary sources with illuminating insights and perspectives to be identified. It also helps to align archaeology within the social, cultural and political calendar.37 Analytically, ‘the Season’ provides a mode of framing the exhibition as both a temporary space and a changing one, impermanent in all aspects, both physical and metaphorical. The objects were different, spacing was different, sites were different, even exhibition locations could change from year to year. Perhaps it was this tradition of impermanence that made audiences return – if it had not been such an effective mechanism for archaeologists another mode of communication and promotion would have been employed. The context of the annual exhibition season should be also be read against the shifting social and cultural landscape of London – a city constantly in flux. They can be viewed as part of its modern cosmopolitism, with its changing boundaries of class, culture and geography; links to foreign countries, commerce and the sense of the world marketplace, trading experiences as well as goods (e. g. Walkowitz, 2012). Exhibitions were permeable borderlands between ancient and modern, East and West, public and private, politics and culture, the academy and commerce. The exhibitions cemented archaeologists, the organisations/institutions/groups supporting them and the sites they excavated into London’s social and cultural calendar, within reach of that most valuable commodity - the public imagination. 1This paper is a significant expansion of research first presented in a lecture at Petrie Museum in 2010, and a paper given at the 2011 Visualisation in Archaeology Conference at Southampton University and Chapter 4 of the author’s doctoral thesis (Thornton, 2011b). For further discussion of the role of Funds in British archaeology overseas see Thornton (2013a). 2See Flanders (2006: Ch 10) for a discussion of the public display of fine art in private houses in the early 19th century. 3See Stevenson (2013) for an examination of object dispersal from British excavations in Egypt. See Bagh & Nielsen (2011: 14–15, 17) for a detailed exploration of the relationship between Petrie and Ny Carlsberg Glyptotek curator Valdemar Schmidt facilitating the donation of Petrie excavated objects to the Glyptotek and the role of the exhibition in fostering these contacts. Although most of the artefacts brought back to London were dispersed, some of them returned to Egypt having been loaned by the Cairo Museum for exhibition (e. g. Times, 1895; Garstang, 1901). 4The Illustrated London News played a major role in publicising archaeological research in the 19th and 20th centuries (see Bacon, 1976). Montserrat notes the importance of the Illustrated London News in publicising work in Egypt, particularly at Amarna, during the interwar period (2002: 74). 5Agatha Christie describes the ‘season’ for the English in Egypt in the early 20th century in her autobiography (1977: 166–175). 7Petrie’s relationship with Kennard and Haworth remained strong for several years; with their direct sponsorship Petrie excavated for four seasons, from 1888 to 1892. A full list of funders for Petrie’s excavations in Egypt is available at Digital Egypt for Universities (UCL, 2002). 8The Egyptian Hall was demolished in 1905 (Hobhouse, 1971: 130). Currently, Egyptian House, at 170–173 Piccadilly, occupies the site. 9See Challis (2013: Ch 5) for a more detailed discussion of the Hawara exhibition in the context of Victorian ideals of beauty and Petrie’s racial theories, and the eventual distribution of the portraits. 10An EEF financial report of 1900 indicates that £32 12s 11d was spent on the exhibition and £29 19s 2d was spent in 1901 (EEF, 1900/1901: 11). 11Also see Stevenson (2014: 8–9) for a discussion of Petrie’s financial anxieties and the resulting affect on the quality of excavations and publications. 12Young (2013) has recently examined Annie Pirie Quibell’s experience in Egypt. 14Garstang also had some previous experience organising an exhibition in Lancashire following excavations in Ribchester in 1899 (Thornton, 2011b). 15Garstang’s 1902 exhibition was held at the Ashmolean Museum and his 1905, 1906 and 1908 exhibitions were held in Liverpool. 16For a history of the early Anglo-Egyptian Condominium period in Sudan see Daly (1986). 17Mrs Lena George was a practicing artist whose work was featured in the Autumn Exhibition of Modern Art at Liverpool’s Walker Art Gallery in 1914 (George, 1914). 18Based in Covent Garden, Brucciani & Sons also provided casts for the Royal Academy and Government schools of art (The Times, 1880). For more information on Brucciani, see University of Glasgow and HATII (2011b). Ian Jenkins (1990) has explored the history of Brucciani’s contributions to the British Museum’s collections. 19The Wellcome Research Institution opened in 1932, and was the physical amalgamation of Henry Wellcome’s varied interests in archaeology, anthropology, medical research and the history of medicine. The Wellcome Historical Medical Museum, which had opened in 1913, was closed after the new building was built (see Larson, 2009: 263–270; Thornton, 2012). 20Unfortunately the PEF Minute Book records nothing of the effect of the controversy on the exhibition’s visitor numbers. 21On Lavers and the Olympic torch, see V&A (n. d.) and The Times (1948). Lavers later worked as architect to Leonard Woolley at Tell Atchana in Syria - see The Times (1938). 22For a history of the rivalry between University College London and King’s College London, see Harte & North (2004). 23For a description of the delights of the London Season for tourists, see Baedeker (e. g. 1900: 1–2) or Pascoe (e. g. 1902). 24Petrie donated several artefacts for the Burlington Fine Arts Club’s 1895 exhibition, noted in its catalogue (BFAC 1895). For information on the Burlington Fine Arts Club’s history, see BFAC (1912). Information on London clubs and societies can also be found in Baedeker (e. g. 1900: 100–103). 25The Savile Club, formed for the benefit of literary and artistic gentlemen, moved from Savile Row to Piccadilly in 1882, and in 1927 to Brook Street; see The Times (1927). 26Garstang’s 1911 exhibition was particularly publicized because during the season a well-preserved Roman era bronze head had been found. The head was originally supposed to be the Emperor Germanicus (see The Times, 1911b) but this was quickly changed to the Emperor Augustus. The British Museum acquired the head in 1911 after it had been shown at Burlington House. It remains on display in the Museum today in Room 70 (GR 1911.1–1.1), and is a “Highlight Object”. It featured in the History of the World in 100 Objects programme (e. g. British Museum, n. d.; Macgregor, 2010: 221–226). 27Agnes Conway developed a lifelong interest in archaeology at Newnham College Cambridge during this period (see Thornton 2011a). Although she was unsuccessful in persuading the Petries to accept her as an excavation team member at this stage, eventually she become an archaeologist in the British Mandate Territory of Transjordan, and in 1929 was part of a team conducting the first scientific excavations at Petra (Conway, 1911; Thornton, 2011a: 37). 28These “Egyptian Exhibitions” are Garstang’s exhibition of antiquities from Meroe, Sudan and the EEF’s exhibition of antiquities from Abydos and Artinoe, Egypt (see Appendix 2). The “Club” to which Conway refers is most likely the Lyceum Club. Founded in 1904, membership was open only to professional and university educated women, and those whose fathers or husbands were particularly well connected. It was originally located at 128 Piccadilly (Crawford, 2001: 124–125). 29Eckenstein was already a noted cultural historian and feminist, and wrote two books on Egypt (Oldfield, 2004). 30The bronze head referred to in Crowfoot’s letter is the “Head of Augustus”. 31See Davidoff (1986: Ch 3) on the etiquette of visiting cards. 33The idea of exhibition as instructive over beautiful was identified in 1902 as a particularly English trait (Cook, 1902: 338). 34Excavated British antiquities were shown at meetings of archaeological societies such as the Royal Archaeological Institute (e. g. RAI 1880). The Society of Antiquaries also hosted exhibitions following excavations at Silchester at the turn of the 20th century (RAI 1901, 1902). 35For a discussion of crowd-funding and crowd-sourcing in archaeology today see Bonacchi et al (2014). 36While the products of British archaeology were more overtly visible in pre-war international exhibitions (e. g. Thornton 2014b), by the 1920s imperial exhibitions such as the Wembley Empire Exhibitions of 1924 and 1925 barely represented countries in which British archaeological research was conducted. While Palestine was included in the Wembley exhibitions, with their predominant focus on economic activities archaeology was only featured in the accompanying handbook as a vital part of the Mandate government’s improvements in tourism infrastructure in Palestine (PPOC 1924; Roberts 2007). For a general history of the Wembley exhibitions see Knight and Sabey (1984); for a case study of imperial West Africa at the exhibitions see Stephen (2009). 37A similar concept, ‘periodicity’, has been explored in Mussell’s analysis of the Royal Society’s publication and meeting schedule (2007: 147–181). Dr Amara Thornton is a British Academy Postdoctoral Research Fellow at the UCL Institute of Archaeology; she holds a PhD from UCL. Her PhD thesis (2011) was entitled British Archaeologists, Social Networks and the Emergence of a Profession: The social history of British archaeology in the Eastern Mediterranean and Middle East 1870–1939. Thanks are due to Stephen Quirke and Alice Stevenson for permission to examine and quote from the Petrie Museum catalogues and to reproduce images; Debbie Challis; Sara Perry; Chris Naunton for permission to examine the EES catalogues and minute books, and reproduce an image; Felicity Cobbing for permission to examine the PEF’s archives and reproduce images; Adam Fraser; Patricia Winker and Stephen Snape for permission to access and quote from the Garstang archive; Syndics of Cambridge University Library for permission to quote from the Conway papers. Thanks are also due to the British Academy for funding my Postdoctoral Fellowship at UCL. Altick, R D (1978). The Shows of London. Cambridge, MA: The Belknap Press. Anon (n d). [Untitled biography of Gerald Lankester Harding] In: Harding archive: private collection. Artefact (n d). McWilliams, Herbert Hastings. Available at: http://www.artefacts.co.za/main/Buildings/archframes.php?archid=2262 [Accessed 28 October 2013]. Ashton, R (2012). Victorian Bloomsbury. New Haven, CT: Yale University Press. Athenaeum (1890). Mr Petrie’s Forthcoming Exhibition of Egyptian Antiquities. Athenaeum August 30 18903279: 297–298. [British Periodicals]. Bacon, E ed. (1976). The Great Archaeologists and their discoveries as Originally Reported in the pages of the Illustrated London News. London: Secker & Warburg. Baedeker, K ed. (1885). Egypt: Handbook for Travellers. Part First: Lower Egypt, with the Fayum and the Peninsula of Sinai. 2nd ed. Leipsic: Karl Baedeker, Publisher. Baedeker, K ed. (1900 ). London and its environs 1900: a handbook for travellers. Reprint ed. Mortonhampstead: Old House Books. Bagh, T and Nielsen, A M eds. (2011). Finds from W. M. F. Petrie’s Excavations in Egypt in the Ny Carlsberg Glyptotek. Copenhagen: Ny Carlsberg Glyptotek. Beard, M (1993). Casts and cast offs: the origins of the Museum of Classical Archaeology. Proceedings of the Cambridge Philological Society 39: 1–29. BFAC [Burlington Fine Arts Club] (1895). The art of ancient Egypt: a series of photographic plates representing objects from the exhibition of the art of ancient Egypt, at the Burlington Fine Arts Club, in the summer of 1895. London: Burlington Fine Arts Club. BFAC [Burlington Fine Arts Club] (1912). History, regulations and bye-laws, with a list of members. London: Burlington Fine Arts Club. Blunt, W (1964). Cockerell: Sydney Carlyle Cockerell, friend of Ruskin and William Morris and Director of Fitzwilliam Museum Cambridge. London: H. Hamilton. Bowring, J (2012). 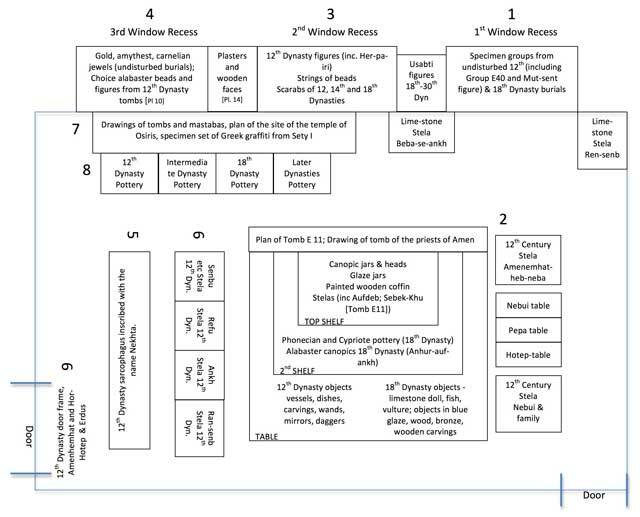 Chronology of Temporary Exhibitions at the British Museum. Accessed 3 March 2014 http://www.britishmuseum.org/pdf/RP_Exhibitions_Chronology.pdf. British Museum (n d). Collections online: The Meroë Head/Head of Augustus. [Online] Available at: http://www.britishmuseum.org/research/collection_online/collection_object_details.aspx?objectId=466397 &partId=1 [accessed 6 Dec 2013]. Brooker, P (2004). Bohemia in London: The Social Scene of Early Modernism. Basingstoke: Palgrave Macmillan. BSAE [British School of Archaeology in Egypt] (1911). Catalogue of Egyptian antiquities found by Prof. Flinders Petrie and Students at Hawara, Gerzeh, Mazghuneh and Memphis. London: University College. Challis, D (2013). The Archaeology of Race: The Eugenic Ideas of Francis Galton and Flinders Petrie. London: Bloomsbury. Christie, A (1977). An Autobiography. New York: Dodd, Mead & Co..
Cook, E T (1902). Highways and Byways in London. London: Macmillan. Coombes, A (1994). Reinventing Africa: Museums, Material Culture and Popular Imagination. New Haven, CT: Yale University Press. Cormack, R (2013). Unity out of diversity? The making of a modern Christian monument in Anglo-Egyptian Sudan In: Swenson, A and Mandler, P eds. From Plunder to Preservation: Britain and the Heritage of Empire, c. 1840–1940. London: British Academy, pp. 63–90. Proceedings of the British Academy 187. Crawford, E (2001). The Women’s Suffrage Movement: A Reference Guide 1886–1928. London: Routledge. Daly, M (1986). Empire on the Nile: The Anglo-Egyptian Sudan 1898–1934. Cambridge: Cambridge University Press. Davidoff, L (1986). The Best Circles: Society Etiquette and the Season. London: The Cresset Library. Del Vesco, P (2013). Betrò, M. and Miniaci, G. eds. Day after day with Flinders Petrie: pocket diaries from the Petrie Museum of Egyptian Archaeology, University College London. Talking along the Nile: Ippolito Rosellini, travellers and scholars of the 19th century in Egypt. Proceedings of the International Conference held on the occasion of the presentation of Progetto Rosellini. Pisa. June 14–16, 2012, Pisa, ItalyPisa University Press: 83–92. Driver, F and Gilbert, D (1999). Imperial cities: overlapping territories, intertwined histories In: Driver, F. and Gilbert, D. eds. Imperial cities: Landscape, Display and Identity. Manchester: Manchester University Press, pp. 1–20. Drower, M (1982). Gaston Maspero and the birth of the Egypt Exploration Fund (1881–1883). Journal of Egyptian Archaeology 68: 299–317. Drower, M (1985). Flinders Petrie: a life in archaeology. 2nd ed Madison, WI: University of Wisconsin Press. EEF [Egypt Exploration Fund] (1893). Catalogue of drawings of scenes and heiroglyphs, copied from wall-paintings in ancient Egyptian tombs of B.C. 3800 to B.C. 2500, at Der El-Gebrawi, El-Hersheh, and Beni Hasan. Manchester: Egypt Exploration Fund. EEF [Egypt Exploration Fund] (1900/1901). Report of the 15th Ordinary General Meeting […]. London: Kegan Paul, Trench, Trubner & Co..
EEF [Egypt Exploration Fund] (1907). Catalogue of an exhibition of antiquities found by officers of the Egypt Exploration Fund in the XIth Dynasty Temple at Deir El-Bahari and at Oxyrhynchus, 1906–7. London: Egypt Exploration Fund. EEF [Egypt Exploration Fund] (1914). Catalogue of exhibition of antiquities found by the officers of the Egypt Exploration Fund at Antinoe and Abydos […]. London: Egypt Exploration Fund. EES [Egypt Exploration Society] (1929). Notes and News. Journal of Egyptian Archaeology 14(3/4): 272–274. Evans, H and Evans, M (1976). The Party that lasted 100 Days: the Late Victorian Season: A Social Study. London: Macdonald and Jane’s. Flanders, J (2006). Consuming Passions: Leisure and Pleasure in Victorian Britain. London: HarperPress. Garstang, J (1911). Excavations at Meroe, Sudan, Second Season 1911, Guide to the tenth annual exhibition of antiquities discovered […]. Institute of Archaeology University of Liverpool. Garstang, J (1912). Excavations at Meroe, Sudan, 1912. Guide to the eleventh annual exhibition of antiquities discovered. […]. Institute of Archaeology University of Liverpool. Garstang, J and George, W S (1913). Excavations at Meroe, Sudan, 1913, Fouth season. Guide to the twelfth annual exhibition of antiquities discovered. […]. Institute of Archaeology University of Liverpool. Garstang, J and Phythian-Adams, W J T (1914). Excavations at Meroe, Sudan, 1914. Fifth season. Guide to the thirteenth annual exhibition of antiquities discovered. […]. Institute of Archaeology University of Liverpool. Garstang, J and Sayce, A H (1910). Excavations at Meroe Sudan, 1910: Guide to the ninth annual exhibition of antiquities discovered. Institute of Archaeology University of Liverpool. Gibson, S (1999). British Archaeological Institutions in Mandatory Palestine, 1917–1948. Palestine Exploration Quarterly 131: 115–143. Gill, D W J (2011). Sifting the soil of Greece: the early years of the British School at Athens (1886–1919). London: Institute of Classical Studies. Greenhalgh, P (1988). Ephemeral vistas: the Expositions Universelles, Great Exhibitions, and World’s Fairs, 1851–1939. Manchester: Manchester University Press. Harte, N and North, J (2004). The World of UCL: 1828–2004. 3rd ed London: University College. Hill, K (2005). Culture and Class in English Public Museums, 1850–1914. Aldershot: Ashgate. Hobhouse, H (1971). Lost London: A Century of Demolition and Decay. London: Macmillan. Hoffenberg, P (2001). An Empire on Display: English, Indian, and Australian Exhibitions from the Crystal Palace to the Great War. Berkeley, CA: University of California Press. Horn, P (1992). High Society: The English Social Elite, 1880–1914. Stroud: Alan Sutton. Horrall, A (2001). Popular Culture in London c. 1890–1910: the transformation of entertainment. Manchester: Manchester University Press. James, H (1878). The Picture Season in London. The Galaxy 24(2): 149–161. Janssen, R (1992). The first hundred years: Egyptology at University College London 1892–1992. London: Petrie Museum. Jenkins, I (1990). Acquisition and Supply of Casts of the Parthenon Sculptures by the British Museum, 1835–1939. The Annual of the British School at Athens 85: 89–114. Jenkins, I (1992). Archaeologists and Aesthetes: In the Sculpture Galleries of the British Museum. London: Trustees of the British Museum. Kakissis, A (2009). The Byzantine Research Fund archive: encounters of Arts and Crafts architects in Byzantium In: Llewellyn Smith, M. and Calligas, E. eds. Scholars, travels, archives: Greek history and culture through the British School at Athens. London: British School at Athens, pp. 125–144. Kelly & Co. Ltd (1895). Post Office London Directory for 1895. London: Kelly & Co. Ltd.. (Part 2: Street Directory). [Online] http://cdm16445.contentdm.oclc.org/cdm/ref/collection/p16445coll4/id/8845 Accessed 1 April 2014. Kember, J., Plunkett, J. and Sullivan, J. (2012). Popular Exhibitions, Science and Showmanship, 1840–1910 In: London: Pickering and Chatto. Knight, D and Sabey, S (1984). The Lion Roars at Wembley: British Empire Exhibition 60th Anniversary 1924–1925. London: Barnard & Westwood, Limited. Kurtz, D (2000). The reception of Classical art in Britain: An Oxford story of plaster casts from the antique. Oxford: Archaeopress. Larson, F (2009). An Infinity of Things: How Sir Henry Wellcome Collected the World. Oxford: Oxford University Press. Luckhurst, R (2012). The Mummy’s Curse: The True History of a Dark Fantasy. Oxford: Oxford University Press. Lyons, H G (1914). The law relating to antiquities in Egypt. Journal of Egyptian Archaeology 1: 45–46. MacCarthy, F (2006). Last Curtsey: The End of the Debutantes. London: Faber and Faber. Macgregor, A (1998). The Ashmolean Museum In: Brock, M. G. and Curthoys, M. C. eds. The history of the University of Oxford. Oxford: Oxford University Press, VI(1)pp. 598–610. Macgregor, N (2010). A History of the World in 100 Objects. London: The British Museum. Mansfield, P (1973). The British in Egypt. Newton Abbott: Victorian & Modern History Book Club. Martin, P (1921). The Sudan in Evolution: A study of the economic, financial and administrative conditions of the Anglo-Egyptian Sudan. London: Constable and Company, Ltd..
Monro, J (1902). Scientific London In: Sims, G. R. ed. Living London: its work and its play, its humour and its pathos, its sights and its sounds. London: Cassell & Company, Ltd., 3pp. 272–278. Montserrat, D (2000). Akhenaten: history, fantasy, and ancient Egypt. London: Routledge. Moser, S (2006). Wondrous Curiosities: Ancient Egypt at the British Museum. Chicago: University of Chicago Press. Mothersole, J (1922). Hadrian’s Wall. London: John Lane The Bodley Head Ltd..
Mussell, J (2007). Science, Time and Space in the Late Nineteenth Century Periodical Press: Movable Types. Aldershot: Ashgate. Naunton, C (2010). The Film Record of the Egypt Exploration Society’s Excavations at Tell el-Amarna. KMT 21: 45–53. Parezo, N and Fowler, D (2007). Anthropology Goes to the Fair: The 1904 Louisiana Purchase Exposition. Lincoln, NE: University of Nebraska Press. Pascoe, C E (1902). London of To-Day: Handbook for the Season 1902. London: Simpkin, Marshall, Hamilton, Adams Kent & Co. Ltd..
PEF [Palestine Exploration Fund] (1928). Notes and News. Palestine Exploration Fund Quarterly Statement, July 1928: 111–118. Petrie, W M F (1892). Catalogue of antiquities from Tell el-Amarna, Upper Egypt […]. London: University College. Petrie, W M F (1894). 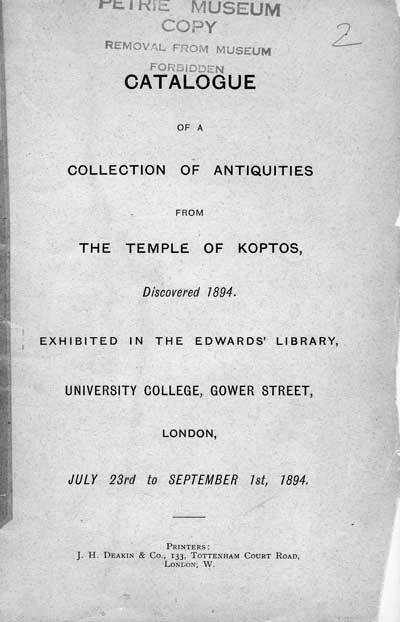 Catalogue of antiquities from The Temple of Koptos […]. London: University College. Petrie, W M F (1896). Catalogue of antiquities from Thebes […]. London: University College. Petrie, W M F (1897). Catalogue of Antiquities from Excavations at Deshasheh and Behnesa (Egypt Exploration Fund) and El Kab (Egyptian Research Account) […]. London: University College. Petrie, W M F (1898). Catalogue of antiquities from excavations of the Egypt Exploration Fund at Dendereh and the Egyptian Research Account at Hierakonopolis […]. London: University College. Petrie, W M F (1899). Catalogue of antiquities from Egypt Exploration Fund excavations at Diospolis and a loan collection of prehistoric vases […]. London: University College. Petrie, W M F (1900). Catalogue of antiquities from excavations at Abydos, found by the Egypt Exploration Fund and the Egyptian Research Account […]. London: University College. Petrie, W M F (1901). Catalogue of antiquities from excavations at Abydos, found by the Egypt Exploration Fund and the Egyptian Research Account […]. London: University College. Petrie, W M F (1903). Catalogue of Egyptian antiquities found by Prof Flinders Petrie at Abydos, and Drs Grenfell and Hunt at El Hibeh, Oxyrhynchus, &c (Egypt Exploration Fund) and drawings from the Osireion, (Egyptian Research Account) […]. London: University College. Petrie, W M F (1904). Catalogue of Egyptian antiquities found by Prof Flinders Petrie at Ehnasya, and Dr Naville & Mr Hall at Deir el Bahri, and Drs Grenfell & Hunt at Oxyrhynchus, (Egypt Exploration Fund), Mr Loat at Gurob, drawings from the Osireion, and drawings from tombs at Saqqara by Misses Murray, Hansard and Mothersole (Egyptian Research Account). London: University College. Petrie, W M F (1905). Catalogue of the Egyptian antiquities found in the peninsula of Sinai, and at Pithom, Oxyrhynchus and Thebes; and drawings of tombs at Saqqara; for the Egypt Exploration Fund and the Egyptian Research Account. London: University College. Petrie, W M F (1931). Seventy Years in Archaeology. London: Sampson Low, Marston & Co. Ltd..
Pinch-Brock, L (2007). The Short Happy Life of Harold Jones, Artist and Archaeologist In: Fortenberry, D. ed. Who Travels Sees More: artists and architects discover Egypt and the Near East. Oxford: Oxbow Books, pp. 31–39. PPOC [Palestine PavilionOrganisation Committee] (1924). Palestine Pavilion Handbook and Tourist Guide. London: Fleetway Press, Ltd..
RAI [Royal Archaeological Institute] (1880). Proceedings at Meetings of the Royal Archaeological Institute: Antiquities and Works of Art Exhibited. Archaeological Journal 37: 426. RAI [Royal Archaeological Institute] (1885). Report of the Council for the Year 1884–5. Archaeological Journal 42: 477–480. RAI [Royal Archaeological Institute] (1886). Report of the Council for the Year 1884–5. Archaeological Journal 43: 442–445. RAI [Royal Archaeological Institute] (1887). Report of the Council for the Year 1884–5. Archaeological Journal 44: 420–425. RAI [Royal Archaeological Institute] (1901). Current Archaeology: Silchester. Excavations During the Year 1900. Archaeological Journal 58: 214–218. RAI [Royal Archaeological Institute] (1902). Current Archaeology: Silchester. Archaeological Journal 59: 201–203. Riggs, C (2010). Ancient Egypt in the Museum: Concepts and Constructions In: Lloyd, B. ed. A Companion to ancient Egypt. Chichester: Blackwell Publishing Ltd., IIpp. 1129–1153. Roberts, D (2007). Palestine on Display: The Palestine Pavilion at the British Empire Exhibition of 1924. The Arab Studies Journal 15(1): 70–89. Ryan, D S (1999). Staging the imperial city: The Pageant of London, 1911 In: Driver, F. and Gilbert, D eds. Imperial cities: Landscape, Display and Identity. Manchester: Manchester University Press, pp. 117–135. Sayce, A H (1923). Reminiscences. London: Macmillan & Co. Ltd..
Scott, J (2003). The pleasures of antiquity: British collectors of Greece and Rome. New Haven: Yale University Press. Smith, P J (2009). A “Splendid Idiosyncrasy”: prehistory at Cambridge 1915–50. Oxford: British Archaeological Reports. Smith, T (1999). ‘A grand work of noble conception’: the Victoria Memorial and imperial London In: Driver, F. and Gilbert, D eds. Imperial cities: Landscape, Display and Identity. Manchester: Manchester University Press, pp. 21–39. Thompson, F M L (1990). Town and Country In: Thompson, F. M. L. ed. The Cambridge Social History of Britain: 1750–1950. Cambridge: Cambridge University Press, pp. 1–86. Thornton, A (2011b). British Archaeologists, Social Networks and the Emergence of a Profession: the social history of British archaeology in the Eastern Mediterranean and Middle East, 1870–1939. Unpublished PhD thesis. University College London. Thornton, A (2012). Egypt Exploration Society Invades… London Underground?. Egypt Exploration Society Newsletteri 4: 4–5. Thornton, A (2013b). Piccadilly’s Archaeological Shows. Reading Room Notes [blog], October 26 2013b Available from http://www.readingroomnotes.com/1/post/2013/10/piccadillys-archaeological-shows.html [Accessed 11 April 2014]. Thornton, A (2014a). Archaeology on Oxford Street. Reading Room Notes, [blog], April 2 2014a Available from http://www.readingroomnotes.com/1/post/2014/04/archaeology-on-oxford-street.html [Accessed 9 April 2014]. Thornton, A (2014b). I’ll Meet You in St. Louis…. Reading Room Notes [blog], October 15 2014b Available from http://www.readingroomnotes.com/home/ill-meet-you-in-st-louis [Accessed 30 October 2014]. Thornton, A (). in prep Public Egypt. Unpublished MSS. UCL [University College London] (2002). The Archaeological Record: Flinders Petrie in Egypt. [online] Available at: http://www.digitalegypt.ucl.ac.uk/archaeology/petriedigsindex.html [accessed 22 October 2013]. University of Glasgow (2006). Exhibition Culture in London Database. [online]. Available at: http://www.exhibitionculture.arts.gla.ac.uk/ [accessed 5 Dec 2013]. University of Glasgow and HATII (2011a). Mapping the Practice and Profession of Sculpture in Britain and Ireland 1851–1951, database [online] Available at: http://sculpture.gla.ac.uk [accessed 5 Dec 2013]. University of Glasgow and HATII (2011b). Domenico Brucciani. Mapping the Practice and Profession of Sculpture in Britain and Ireland 1851–1951, database [online]. Available at: http://sculpture.gla.ac.uk [accessed 12 Dec 2013]. V. & A. (n d). Olympic Torch, by Ralph Lavers, 1947. Available at: http://www.vam.ac.uk/content/articles/o/olympic-torch/. Walkowitz, J (2012). Nights Out: Life in Cosmopolitan London. New Haven, CT: Yale University Press. Whitaker, J (1899 ). An Almanack for the Year of Our Lord 1900. Facsimile edn. London: Stationery Office. Whiteley, J J L (1998). The University Galleries In: Brock, M. G. and Curthoys, M. C. eds. The history of the University of Oxford. Oxford: Oxford University Press, VI(1)pp. 611–30. Wilson, D (2002). The British Museum: a history. London: The British Museum. Young, L (2013). The Tale of a Mysterious Photo Album. Nekhen News 25: 28–29.